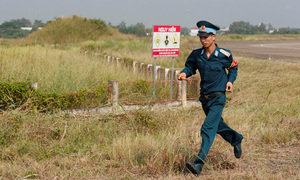 The senior Buddhist dignitary will visit the Great Stupa Mandala Tay Thien in Vinh Phuc Province during his trip. 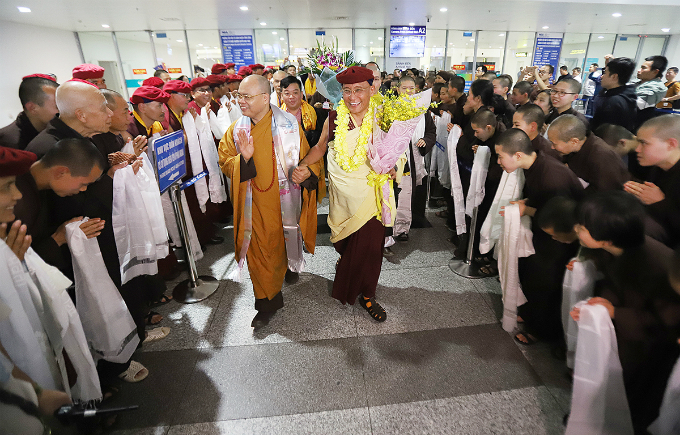 Gyalwang Drukpa and his Sangha arrive at Noi Bai Airport, Hanoi on Wednesday. From Friday to Saturday, His Holiness and Drukpa’s monks will perform blessings for the spring festival in the Great Stupa Mandala Tay Thien (Vinh Phuc Province). Gyalwang Drukpa meets a fellow Buddhist follower. For many years, the spring festival in Tay Thien has attracted both Buddhists and tourists. There will be cultural exchanges and spiritual ceremonies, including the unveiling of Vietnam’s largest jeweled mandala of Bodhisattva Guanyin. 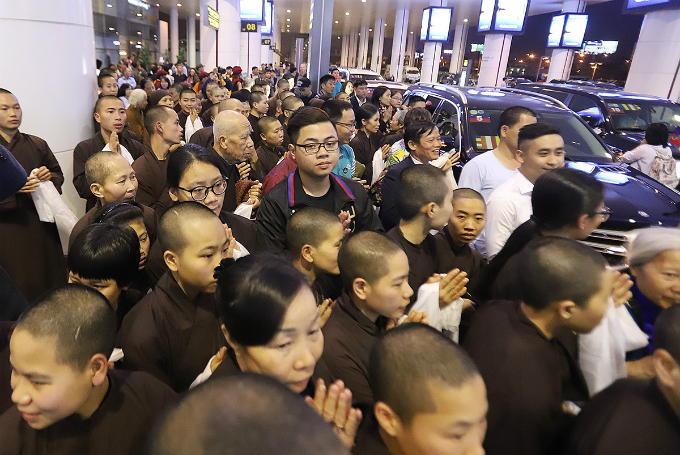 Crowd of Buddhists gather at the airport to welcome the Buddhist leader and his Sangha. Gyalwang Drukpa and a Buddhist leader are welcomed by the crowd. 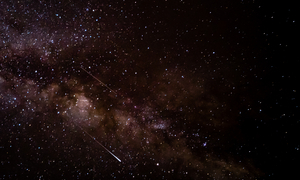 “Spring is the best and most meaningful time of the year for spiritual ceremonies such as blessings. 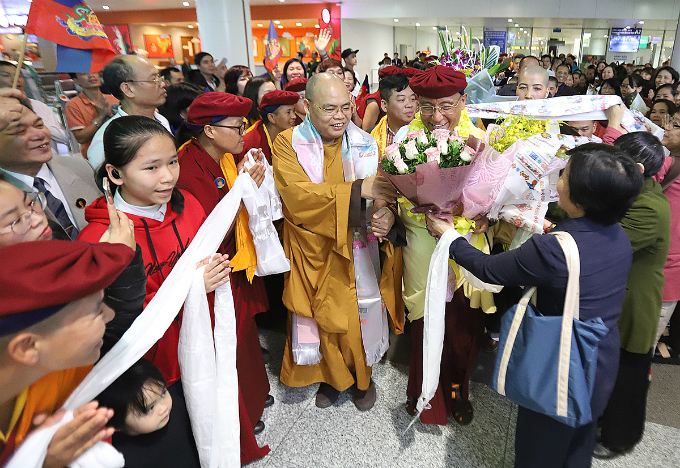 Let us all gather and spread our good will and positive energy to bring health, happiness, luck and peace to everyone,” Gyalwang Drukpa said upon his return to Vietnam. 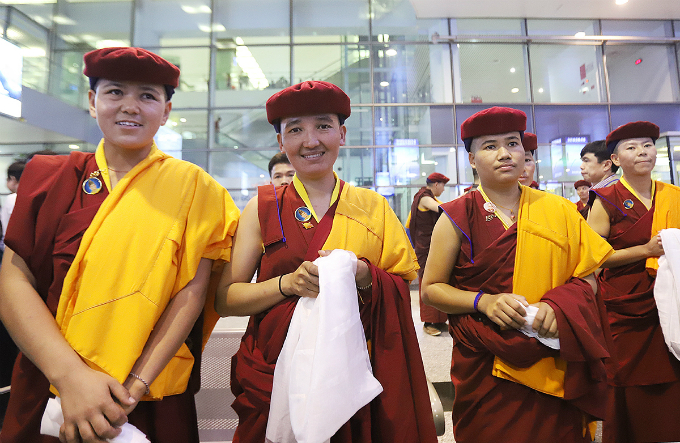 Crowds of watchers gather in Noi Bai Airport to welcome Gyalwang Drukpa. 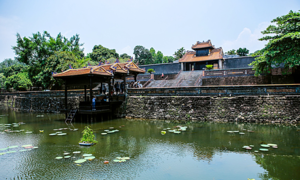 During his time in Vietnam, the Buddhist dignitary will perform ceremonies and blessings at several pagodas with his monks. He will also talk with Vietnamese entrepreneurs and the Buddhist community. Drukpa monks wait outside Noi Bai Airport. 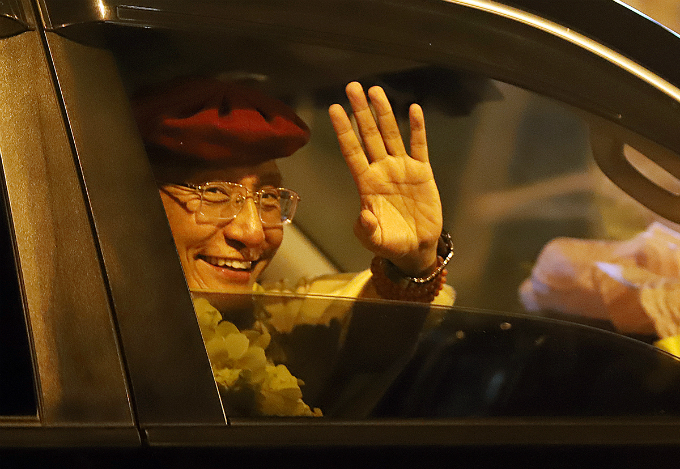 Gyalwang Drukpa and his Sangha go back to the hotel. 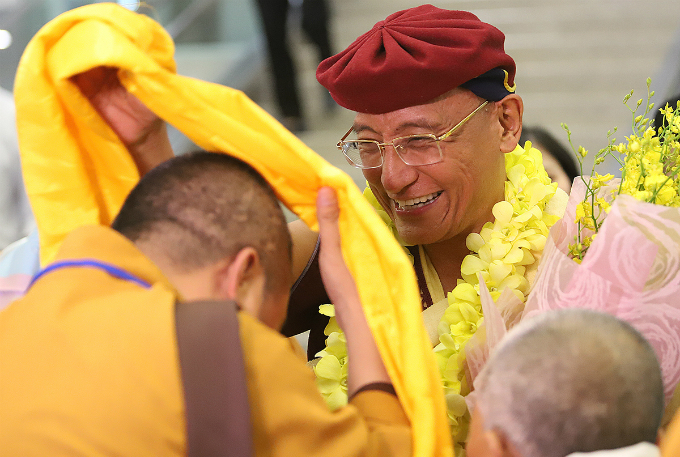 On Thursday, he shared his history with Vietnam, the journey of the Drukpa Lineage and his views on happiness. Vajrayana is one of the various Buddhist traditions of Tantra and "Secret Mantra", which developed in medieval India and spread to Tibet and East Asia. The Gyalwang Drukpa’s first visit to Vietnam was in 2007. 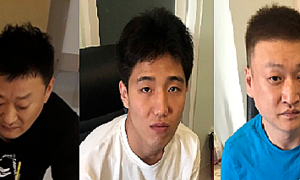 Since then, he has returned to Vietnam multiple times. 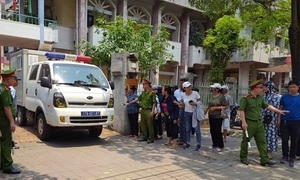 There are more than 14 million Buddhists in Vietnam, amounting to 16.4 percent of the population, according to 2010 data by Per Research Center.